Cockatiel Care - cages, colours, photos, facts and more! CockatielCare.co.uk is a site dedicated to the care of your cockatiel. These lovely creatures are some of the most beautiful and intelligent on earth and make amazing pets. One of the world's most famous birds is the cockatiel which is well known for its gentle, social and intelligent nature. This bird is not at all demanding and makes a wonderful pet. Even beginners would be likely to not have any issues adjusting to this bird's likes. Those who already have this bird consider it to be very lucky for them. Cockatiels are originally found in Australia and are seen as the smallest of the cockatoo (parrot) family. 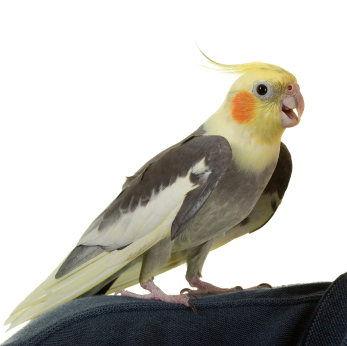 You would find lots of similarities between a cockatiel and a parrot just for the fact that the cockatiel is one of species of parrot. The name sounds more like a Dutch word "Kakatielje" which basically mean a little cockatoo. By their very nature itself these cockatiel birds are very sociable and moderately active and they like to be touched, played and talked to. Most of the time, you will find these birds doing a trick to catch your attention and by singing as well. They live for as long as 15 to 20 years and are found in yellow, white and grey colour. You will find these birds very cheerful and affectionate to the extent that they will groom your hair. Affection is something they want and they would love to get stocked and cuddled and can be trained to talk and whistle. Male are generally seen as better than females for this, but then overall cockatiels are not very clear in their speech when compared to parrots. In size they are smaller than most parrots, don't bite as much and are quieter and cleaner as well. The point you should consider before taking one as a pet is that they are always hand fed. This makes them easy to tame. Think twice before making a selection between a male and a female as they are friendly yet not so expensive birds. Female cockatiels are general more nervous than males. Please take a look around the site to get all the info on cockatiel care! If you would like to find our more about cockatiels, then have a peek at our cockatiel facts, or found out about why cockatiels make good pets.